Some mini-tasks are useful in a pinch but don’t pay much. Here are some options that pay $3-$12 each and sometimes more. Field Agent – Field Agent is an app that gives you micro-jobs such as consumer surveys or checking a price in a store. “Jobs typically pay between $3 and $12 each. Get paid via PayPal or Dwolla.” Click here for details. PineCone Research – PineCone has been around for years and is a top pick among survey takers. Pays $3 per survey. “Surveys typically take 15-20 minutes.” Choose payment by PayPal or check. Details here. Gigwalk – Gigwalk is an app that offers “gigs” based on your location. “Gigs can pay from $3 to $100.” A gig could be checking on the display of a product in a store, or reporting on a marketing event. Payment by PayPal. Details here. InboxDollars – The easiest way to earn $5 at InboxDollars is to sign up and get the $5 signup bonus. Surveys generally pay small amounts but you can get more for signing up for trial offers. For example, $10 for Stamps.com, or $3 for Amazon Prime Video. (If you don’t cancel before the trial is over, of course, you’ll be billed for the membership.) Details here. Swagbucks – Swagbucks also pays a $5 signup bonus and pays for trial offer signups. For example, earn $10 signing up for a 30-day Netflix trial. (They’ve paid out over $133M to members.) Cash out via PayPal or Visa. Details here. ♥ Share the love! If you know someone looking for ways to earn extra cash, please share the post. They’ll love you and we will too! Thank you! 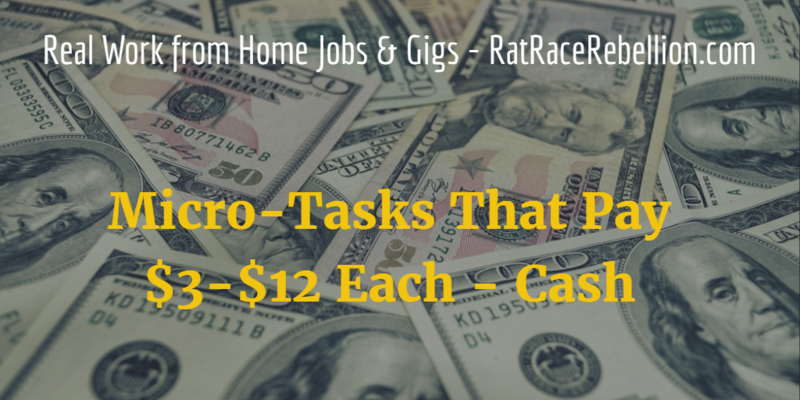 This entry was posted in Earn Extra Cash, Pay-Per-Task & "Gigs". Bookmark the permalink.